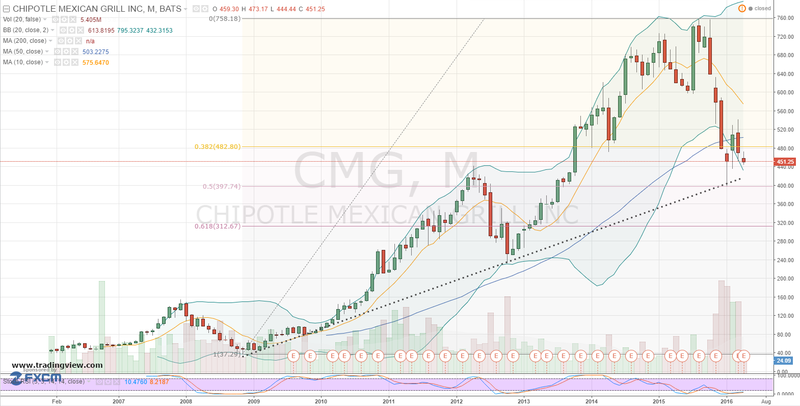 It may not be the freshest investment idea on Wall Street these days, but Chipotle Mexican Grill, Inc. (CMG) stock is looking more and more inviting as a limited risk, contrarian position using a CMG bull put spread. It’s no secret that it has been a tough several months for Chipotle stock. Shares are off by around 40% since hitting an all-time-high of $758 back in mid-August. Broader market conditions haven’t helped. But the real problem for Chipotle stock has been increased concern for the fast-fresh burrito chain’s growth prospects and the E. coli and norovirus outbreaks at Chipotle late last year. But with the latter issue literally and figuratively cleaned up by a very professional and quick-to-act management team and Chipotle now looking to expand its reach as it mulls entering the gourmet burger niche and test pilots a craft beer program to complement its current offerings — is the worst of it behind Chipotle stock? James Cramer recently declared “$400 to $450 is the sweet spot to buy Chipotle stock.” Compared to a price near $467 at the time, Cramer noted shares could experience some near-term hiccups, but patient investors should be rewarded looking out six to 18 months. Technically speaking, I couldn’t agree more with Cramer’s “sweet spot” in Chipotle … well almost. Let me explain. At a share price of $451.25, Chipotle stock is for all intents and purposes at the top of Cramer’s “sweet spot” zone of $400 to $450. As alluded to, technically, I’m seeing value in this price area for shares of CMG as well. Inside this price area, Chipotle stock has potential support from its monthly uptrend line, the 50% retracement level and 2012’s pivot high. Our view is the combination of supports is formidable enough to consider buying Chipotle stock, but with a catch. Given CMG stock’s January low of $399.14 and potentially troubling head-and-shoulders daily chart continuation pattern, I prefer not buying Chipotle stock until it reaches the lower end of support. But what if Chipotle stock doesn’t trade nearer to $400? One idea is to structure buying CMG at its sweet spot using a limited risk, out-of-the-money put vertical. Reviewing CMG’s options, one spread which fits nicely is the May $400 / $395 bull put spread for a credit of $1 or better. For a credit of $1 the trader’s risk is contained to $4, or less than 1% Chipotle’s price, regardless of how low CMG stock potentially trades during the life of the spread. Thus, if Chipotle stock is trading at $350 following earnings and you’re still inclined to be a buyer of shares, simply close the spread, buy shares and your effective purchase price is, worst case, $354. What’s more, the solid risk-to-reward scenario in Chipotle gets even better. Statistically this spread has less than a 13.5% of chance of finishing in-the-money. Chipotle stock would also have to move greater than one standard deviation based on the 40-day holding period and fairly elevated CMG statistical, future volatility of 36%, before the trader starts to lose money on an expiration basis. Bottom line, ordering this spread off the CMG options menu in lieu of buying Chipotle stock sure looks like a tasty investment. Investment accounts under Christopher Tyler’s management do not currently own positions in any of the securities or their derivatives mentioned in this article. The information offered is based upon Christopher Tyler’s observations and strictly intended for educational purposes only; the use of which is the responsibility of the individual. For additional market insights and related musings, follow Chris on Twitter @Options_CAT. Article printed from InvestorPlace Media, https://investorplace.com/2016/04/cmg-fast-fresh-investment-chipotle-stock/.